This blog post introduces what we think is a fundamental understanding of the LaunchPAD Technology Blockchain Development Stack. In brief, it is the emphasis on the consolidation of open source technologies that currently make up the LaunchPAD Technology, which anyone can also build using the frameworks available. The implications of this are quite important, but also quite hard to understand because the computer science concepts are a bit inaccessible to the new users who are not familiar with blockchain and cryptocurrency. What follows is a very informal, non-rigourous description to try and explain the LaunchPAD Technology. We’ve tried to get this simple exchange of information relayed to you, but if you find yourself in a state of utter and dismal confusion, there is another way to understand this technology and that is to watch us — we’re building it! We are building it for you to launch it! Upwards and onwards! A blockchain is a distributed database, otherwise known as a distributed ledger or record of all interaction; a blockchain is stored as a shared and powerful infrastructure on devices all over the world that support its interactions. A copy of all interactions on a blockchain is stored and verified by the users of the particular blockchain, on devices world-wide, in order to protect the network from being taken down or controlled by a single entity or group that may become corrupted and manipulate the data. These users are paid to verify and support the blockchain. This ledger, or record book, is kept and maintained by the users, and so users are given a reason to keep the shared ledger running and shared processing of transactions of data operating; they get paid to maintain this record book through inflation of the underlying backbone of tokens related to the blockchain. This isn’t just one record book stored in a central location that is shared by many, it is a record book duplicated by everyone, so that everyone shares the profits behind keeping this record book up to date. The genius of this record book is that it requires no bank, no centrally owned company, and has no single point of failure. Users do not have to place their trust in any institution, there does not need to be middle-men of any kind. This shared record book is owned by everyone and not by any one individual or organization that can be corrupted. Different blockchains have different record books, not all blockchains are maintained in the same shared record book, therefore, there must be a way to connect between these separate histories, record books, or blockchains. This is the purpose of the LaunchPAD Blockchain Technology of Decentralized Exchange separate, and LNCH is the consolidating force that will connect between all separate blockchains. What are the ingredients for a Decentralized Exchange technology? A cryptocurrency, a blockchain, a community of people, computers, and a way to decide on the rules. People in this particular cryptocurrency community vote for Witnesses to secure their exchange of information and data on the Decentralized Exchange Operating System. 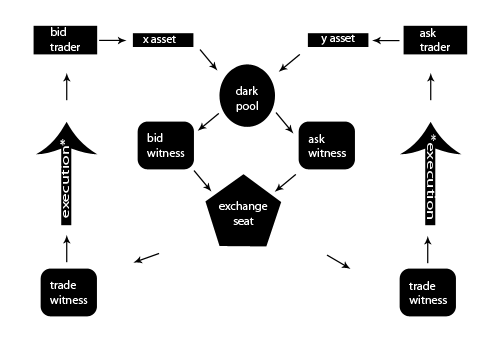 Witnesses make up and verify the Decentralized Exchange’s seats, or centralized locations of verification, where the blockchain is cleared, written, and verified. Only the top 100 Witnesses are paid for their service to the upkeep of the shared ledger. Many want to become a paid Witness and so there are many backup Witnesses actively verifying that the paid Witnesses do their job. Influence is determined by how many tokens a Witness holds. This means that Witnesses who have more tokens will influence the network more than Witnesses who have very few tokens. As the community grows, it gets harder and harder to remain a paid Witness and remain part of an exchange seat’s Witnesses, due to increased competition. Witnesses in the community can remove their support of a Witness that does not do its job, effectively firing the unsatisfactory employee. The system is dependent upon community activity, or computers passively running the verification infrastructure of network interaction, and being paid doing so. A truly Decentralized Exchange is an exchange market for data and information and the relaying of value which simply does not rely on any third party. Whether it is to hold user funds as custodian, manage servers or infrastructure, or to facilitate matching and confirming verification of these exchanges, there is no centralized component at play. This decentralized and distributed technology can be utilized to connect a network of traders, investors, merchants, and the common user with various bid and ask counterparties that deal directly with each other anonymously and without the use of middle-men. Trading becomes automated, executed peer to peer between computers connecting the corresponding blockchains of bid and ask counterparties. Within this infrastructure, tokens can be representative of assets that can be transparently yet privately verified through the decentralized multi-signature system of exchange by Witnesses. Given that it is robustly peer to peer and hard to take down, a truly Decentralized Exchange has multiple layers of defense against malicious attacks, unlike existing centralized trading operations of exchange. Specific servers or institutions housing existing centralized exchange operations are all subject to arbitrary government and managerial control or maintenance, and become vulnerable to single point of failure. A truly Decentralized Exchange provides three decisive benefits to its users and supporters: they are structurally global, and so lightning fast, reliably efficient, and remain open, active and available twenty-four hours every day, seven days every week, given the strength and scope of their distributed and shared network infrastructure. All transactions are anonymous, yet transparent to the bid and ask counterparties, thus ensuring secrecy of transacting amounts and participant identities. The transactions, their personal records, and the network itself are secured and verified by a dynamic proof of stake consensus and security algorithms. Interaction with this blockchain is open to the community of users at a frictionless, incorruptible interaction between users at zero-fees (while centralized exchanges have built-in opportunities for corruption. such as the racket of increasing of fees without representation). The nature of a truly Decentralized Exchange is fundamental to providing safe and true peer to peer internet interactions between different cryptocurrency and blockchain infrastructures. Reducing identity theft, hacking, and centralized corruption is a positive side-effect of Decentralized Exchange, since cryptography renders centralized privacy exploiting KYC (Know Your Client) practices redundant. Users are able to maintain the security of their own information, identity, and private keys, and this security is reinforced by state of the art cryptographic elements. The risk involved in centralized exchange are no longer acceptable; given the development of the internet today, a truly Decentralized Exchange will inevitably open new paths to innovation. Experienced and creative entrepreneurs are expanding these technologies; in addition, a growing network of Decentralized Exchange participants will enable people all around the world to conduct their life and their business globally at a fraction of today’s costs. This is the first step in moving from a world of me to a world of we with the philosophy of abundance. LNCH is promising to be a new decentralized exchange transaction protocol that will allows users to build decentralized exchange applications more efficiently; thus operating faster and more scalable, than its centralized exchange counterparts. LNCH is the open source software in the LaunchPAD Technology Blockchain stack that supports a decentralized exchange’s basic infrastructure and functions, such as scheduling trades, executing trades, and controlling applications that interact with these frameworks. It is quite like Windows / Linux / MacOS with built-in cryptonomic incentives for the purpose of supporting the shared and distributed infrastructure of Decentralized Exchange utilizing shared ledger blockchain technologies. In short, an open source Operating System with its own version of a frictionless Peer-to-Peer Electronic Cash System known as Lightning Cash (LNCH). It will be the infrastructure able to host any sort of frictionless Decentralized Exchange transactions asynchronously, just like the list of operations running “at the same time” in your computer, that can be observed in its Task Manager. A Decentralized Exchange Operating System is a somewhat more focused product compared to Ethereum’s decentralized computer, computers can be installed with multiple Operating Systems. Applications Tokens running on top of LNCH may be hardforked (or in the traditional software terms, updated) without affecting LNCH itself. The DAO incident back in 2016 could have been avoided if Ethereum was designed more like an Operating System, instead of an all encompassing central state machine. LNCH may be on its way to becoming the most widespread consumer product for Decentralized Exchange processes that works as a robust technology infrastructure, much like the Internet, for enabling exchanges of information, data, and value that is hard to take down or censor. This Operating System perspective introduces a blockchain platform that cannot be disrupted by hardforks, an encouraging and welcomed change to the existing first and second generation blockchain infrastructures. To enable distributed exchange of data, information and value of any kind in a private, secure, and un-censorable manner, a most robust infrastructure is necessary and may be what it takes to truly bring blockchains to the masses for an up and coming tokenized economy and programmable-money society. The approach proposed by LNCH for the advancement of blockchain technology infrastructure to enable scalability and flexibility of Smart Contracts and Application Tokens that sit on top of the blockchain can eventually support many different programming languages in parallel on the same Operating System blockchain infrastructure. This can bridge together all blockchains by a decentralized and distributed methodology, allowing for usage of multiple blockchains at the same time, all connected by a common Operating System that enables the distributed exchange of information, data and value between existing incompatible technologies and applications. Conventional tools for secrecy of wealth management and the encryption of wealth creation are being heavily damaged, exposed, and restricted by governments, corporations, hacks and leaks of centralized entities entrusted as trusted third parties. A tokenized backbone for an anonymous framework of “carrier pigeon” trading is urgently necessary. The LNCH software’s Dark Pool Protocol (DPP) introduces a method of hiding trade volumes and trade frequencies within a powerful decentralized, distributed, anonymous, and shareable infrastructure which consolidates all existing models of privacy-focused encrypted interaction within distributed blockchain systems. As a result, it is possible to conduct trading off-blockchains and in the space between blockchains without limitations of existing technology, speed, reliability, or trust. All blockchain to blockchain movement can occur anonymously, instantly, and with heterogeneous blockchain consensus rules. So long as the chains support the same cryptographic hash function, it is possible to make trading across incompatible blockchains and cryptocurrencies without trust in corruptible third party custodians. DPP leverages blockchain technology to build real world resolutions and use-case that demand the use of a token to incentivize more efficient best practices through an alignment of incentive between the parties involved. The following are eight key elements describing the benefits of the LNCH Software. Truly Decentralized: No central or solitary server, third-party authority, or single point of failure. It cannot be shut down. Always Private, Always Secure: All interactions are untraceable. All interactions are supported by a dynamic proof of stake that is quantum-resistant by nature. Allows for cold staking; meaning a proof of staking mechanism where the stake of tokens is not exposed to a hot wallet environment that can be hacked or malfunction. All interaction is encrypted, therefore, any metadata leaks of user history or identity are impossible. Scalable Flexibility: Can support a very high amount of traffic and transaction volumes through existing protocols and existing technologies such as Data Storage Network, Lightning Network, SegWit, IPFS, Onion-Routing, and even GSM or phone to phone. Cross-Blockchain Compatibility: All cryptocurrencies can be transacted between blockchains, or across blockchains, instantly, and at zero-fees. Cross-Protocol Compatibility: Functionality can be buildable and extendable to all protocols. Integration of existing protocols or technology such as Data Storage Network and Lightning Network allows for a consolidation of open technology without compromising decentralization or risk of hardforks. Actively Passive Dynamic Proof of Stake: Users use the blockchain for free and without the friction created by a necessary token to pay fees. There are zero fees and every interaction is free. Tokens are instead used as payment and enforcement markers for the maintenance of the distributed blockchain infrastructure paid for through dynamic voted-upon inflation of the overall token supply as the blockchain network scales. Self-Governed, Self-Regulated: A truly Decentralized Exchange that is truly distributed and decentralized, therefore structurally sound to single point of failure or centralized corruptibility. The technology adopted to being the network is entirely governed by the community that supports this adoption of the technology to start the network, and not by a centralized authority that can be manipulated or corralled. Operating System: Designed to allow for robust Decentralized Exchange infrastructure. LaunchPAD Inc. is a software company and is producing the LaunchPAD Technology as free, open source software. This software technology may enable those who deploy it to launch a blockchain or decentralized applications with the features described above. LaunchPAD Inc. will not be launching a public blockchain based on the LaunchPAD Technology. It will be the sole responsibility of third parties and the community and those who wish to become part of this community of incentivized block producers to implement the features and/or provide the services described above as they see fit. LaunchPAD Inc. does not guarantee that anyone will implement such features or provide such services or that the LaunchPAD Technology will be adopted and deployed in any way. LaunchPAD Inc. is building the LaunchPAD Technology and the LNCH Software, but it will not configure and/or launch any public blockchain platform adopting the open source LaunchPAD Technology (the “LaunchPAD Platform”). Any Launch of a LaunchPAD Platform will occur by members of the community unrelated to LaunchPAD Inc. or by third parties launching the LaunchPAD Platform that may delete, modify or supplement the LaunchPAD Technology prior to, during or after launching of the LaunchPAD Platform. This maintains that the communities adopting the open source technologies to launch the network will be fully decentralized from centralized authorities, or a single point of failure, and so hold a equal, panoptic and auditable mechanism for distribution. All statements in this document, other than statements of historical facts, including any statements regarding LaunchPAD Inc.’s business strategy, plans, prospects, developments and objectives are forward looking statements. These statements are only predictions and reflect LaunchPAD Inc.’s current beliefs and expectations with respect to future events and are based on assumptions and are subject to risk, uncertainties and change at any time. We operate in a rapidly changing environment. New risks emerge from time to time. Given these risks and uncertainties, you are cautioned not to rely on these forward-looking statements. Actual results, performance or events may differ materially from those contained in the forward-looking statements. Some of the factors that could cause actual results, performance or events to differ materially from the forward-looking statements contained herein include, without limitation: market volatility; continued availability of capital and formation of capital, financing and personnel; product acceptance; the commercial success of any new products or technologies; competition; government regulation and laws; and general economic, market or business conditions. Any forward-looking statement made by LaunchPAD Inc. speaks only as of the date on which it is made and LaunchPAD Inc. is under no obligation to, and expressly disclaims any obligation to, update or alter its forward-looking statements, whether as a result of new information, by request, subsequent events or otherwise. What is your opinion on An Overview: LaunchPAD Technology Blockchain Development Stack ?